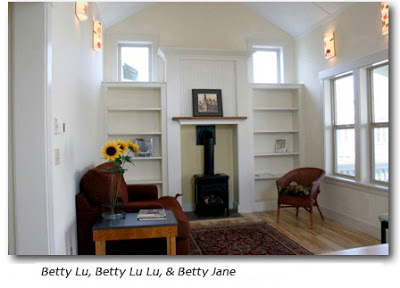 One of the things I most like to do at A Joyful Cottage is take you on cottage tours. I often feature traditional cottages abroad for their timeless appeal. For me it's all in the details. 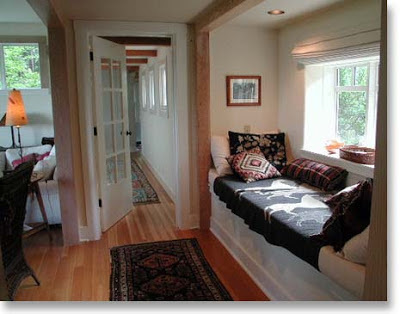 Like deep window wells, plank walls, nooks and crannies, and little architectural surprises. A thatched roof grabs my attention every time. And, oh yes, if there's a cottage garden involved, I'm in. But today I'm staying in the United States. I'm going all American, and I'm delighted and privileged to feature the home designs of Ross Chapin Architects. 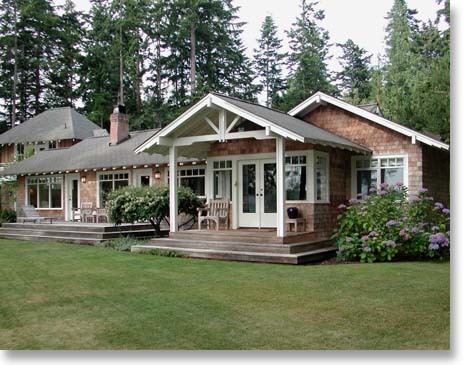 This award-winning Whidbey Island firm has been featured in a plethora of newspapers and magazines, including The New York Times, The Wall Street Journal, Forbes, Cottage Living and Metropolitan Home, just to name a few. 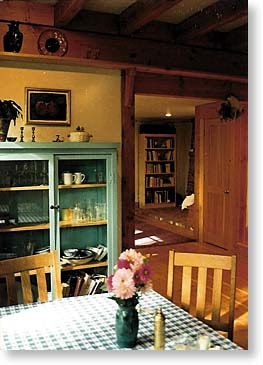 Taunton Press books such as The New Cottage Home by Jim Tolpin, Cottage by M. Caren Connolly and Louis Wasserman, and The Distinctive Home by Jeremiah Eck have included Chapin designs. And Ross Chapin himself has written a book entitled Pocket Neighborhoods. 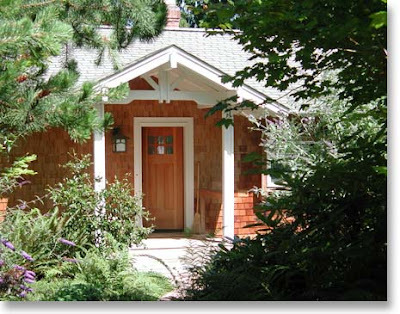 What struck me immediately about these contemporary cottages and small homes is that their judicious use of space is not a sacrifice to charm. Remember, I said "for me it's all in the details." Come, and I'll show you what I mean along the way. Let's start with pocket neighborhoods. 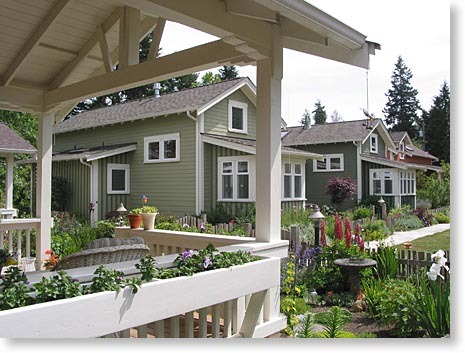 Ross Chapin and developer Jim Soules first partnered in 1996 to create Whidbey Island's Third Street Cottages, eight cheerful cottages gathered around a common green. Chapin coined the name "pocket neighborhood" when the cottages "seemed [to him] like a pocket safely tucking away its possessions from the outside world." 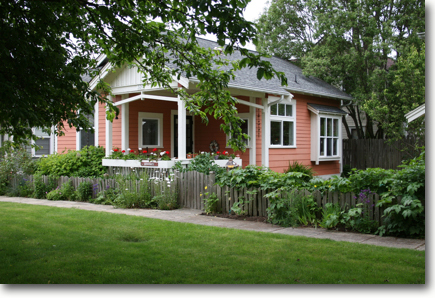 Since the completion of Third Street Cottages more than a dozen pocket neighborhoods have been developed in North America. 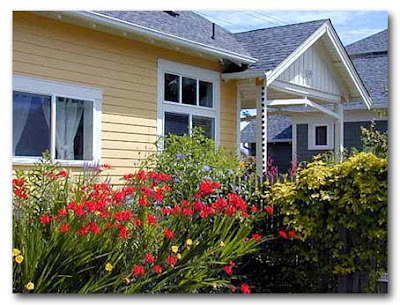 Designed to foster a sense of community, pocket neighborhoods remind me of vintage homes built around a city park, much like the small Midwestern town where I grew up. 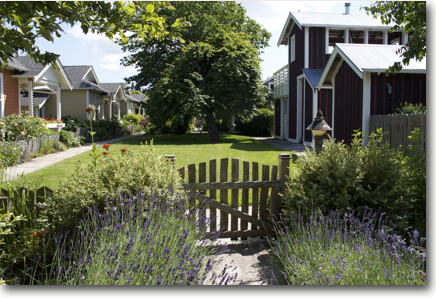 Each cottage boasts its own swinging gate and private garden. 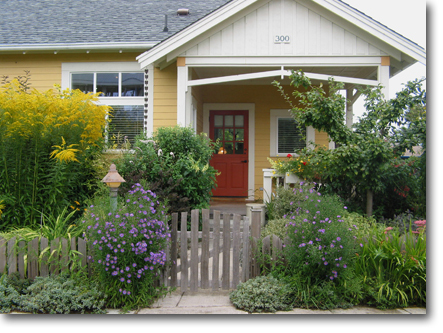 Front porches act as outdoor rooms and invite lingering. Cheerful flower boxes add to the enchantment. 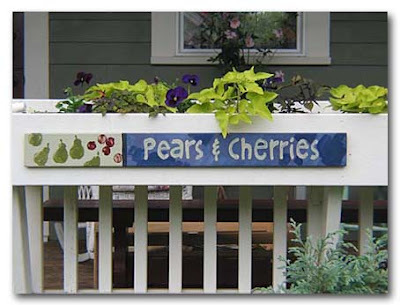 Owners are encouraged to name their cottages. 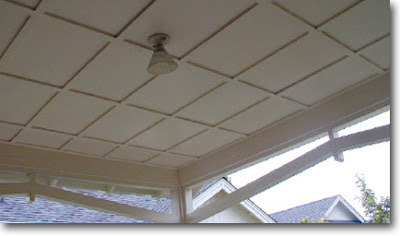 The board and batten ceiling and decorative trim on this porch are extra touches that delight. Are you dying to see what's inside? 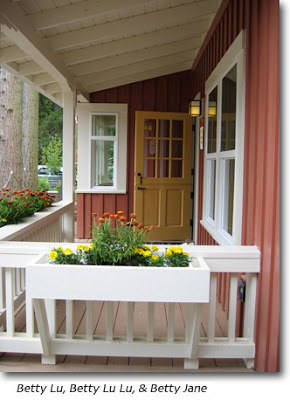 Let's take a peek, starting with the Hilltop Cottage. And by the way, the plans for all the homes I'm showing you are available for purchase through Ross Chapin Architect's Goodfit plan collection. 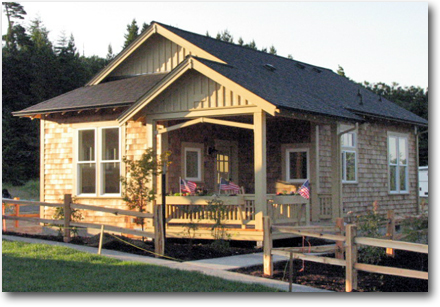 The Hilltop Cottage plan comes in two versions: A 729 sf and B 831 sf. 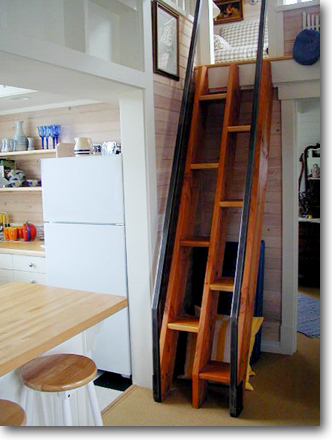 This plan has one bedroom and a loft. 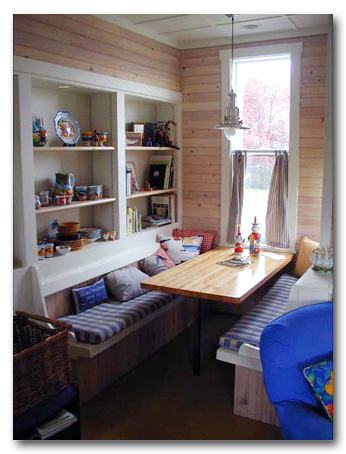 Banquette dining conserves space, but not at the expense of design. 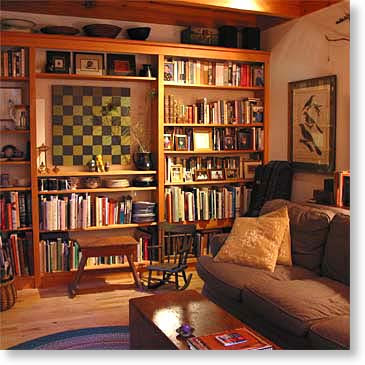 Built-in shelves provide storage and add architectural interest. The tall window is perfect for this space. 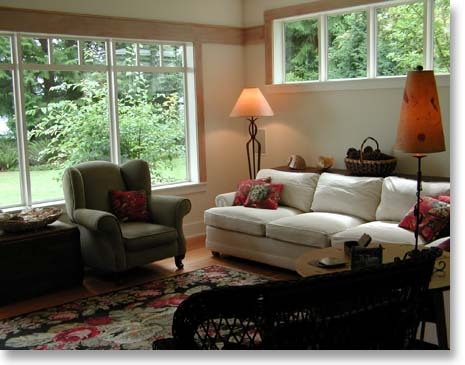 The living room has the deep well windows I love. 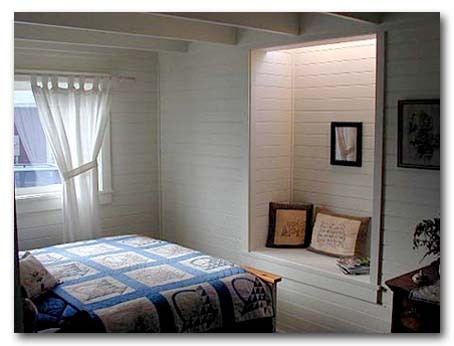 Ceiling beams and a romantic reading nook give this bedroom a vintage feel. More ceiling beams and three small windows -- as opposed to one large -- raise the charm level in the bath. 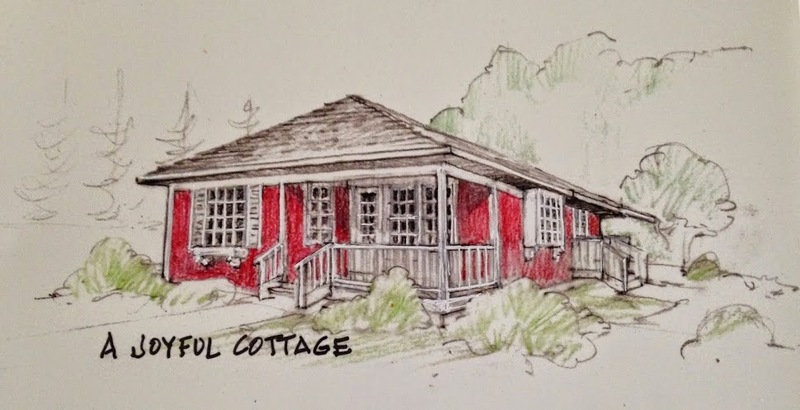 Next up, the 720 sf Bartlett Cottage. The Bartlett's kitchen's craftsman cabinetry is delightful. Very cottagey. Craftsman touches repeat in plank walls, board and batten ceilings . 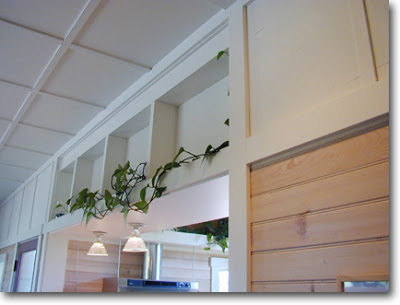 . .
and overhead built in shelves. 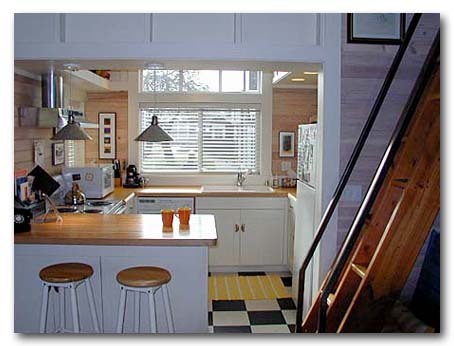 The pitched ceiling and abundance of natural light keep this small cottage from feeling cramped. The raised ambient lighting is a great touch. 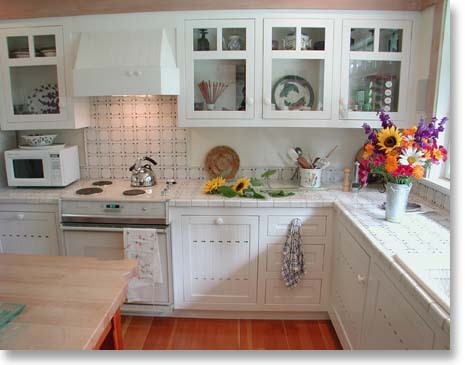 Glass front cabinets maintain the kitchen's openness. The island shows off its nice detail. 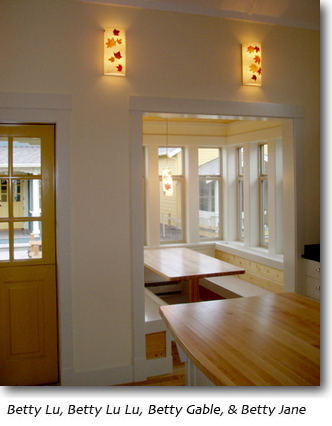 Banquette dining surrounded by windows. Very cozy. Placement of windows above the living room's built-in bookcases increases the natural light. 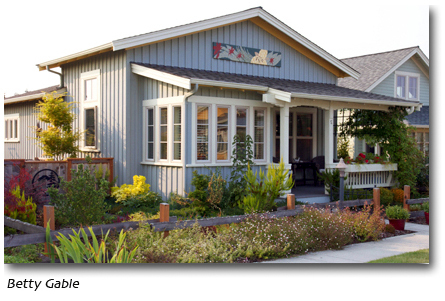 Under the category of Small House plans 1,000 - 2800 sf, Ross Chapin Architects offers a variety of homes filled with character. The 1,824 sf Dine's House is one of my favorites. 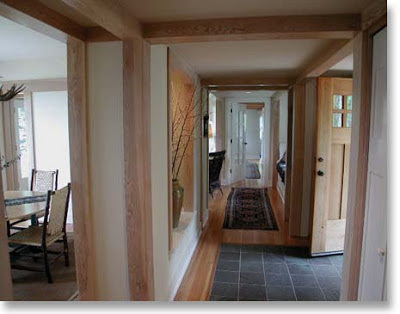 Interior space is beautifully defined with craftsman trim. I could seriously nap right here. 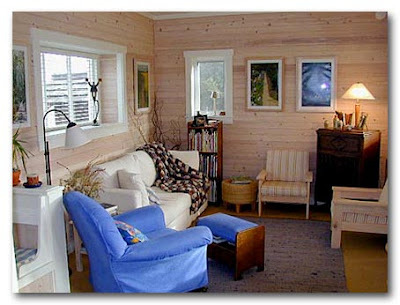 The living room is filled with light and relates well to the outdoors. 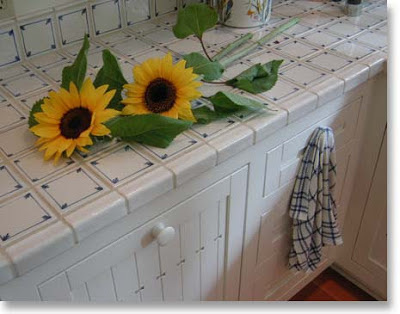 Lots of cottage love in this kitchen. 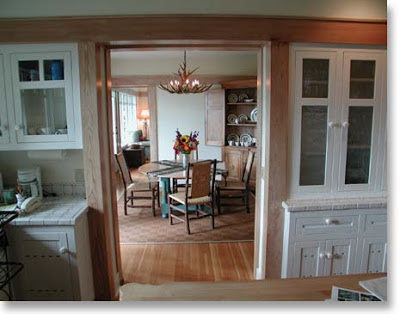 Glass front cabinets, built-in hutch. There's so much to love here. 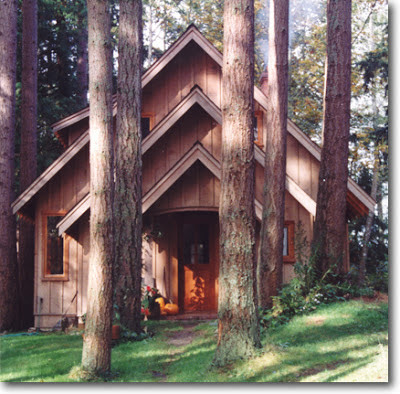 The Three Gable Cottage surprised me. This house seems bigger than its 1,100 sf. 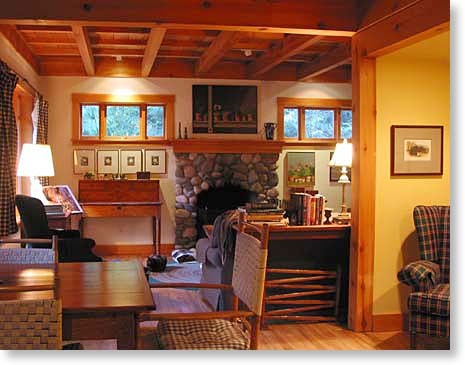 The woodwork in this cottage is beautiful. Large windows and French doors create a sunny living area. 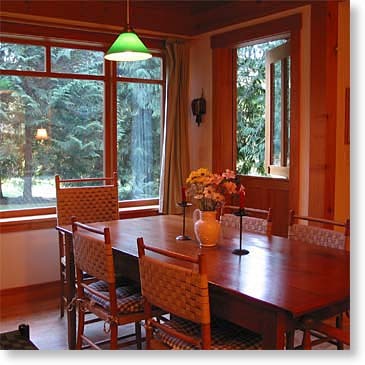 The dining room is warm and inviting. 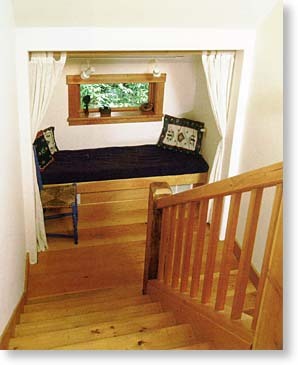 I really like the built-in window seat (or is it a daybed)tucked in the stairwell landing. And there's one of my favorite surprises -- a deep well window. 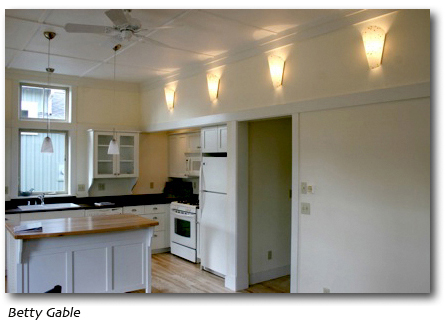 Spruce House is a 1,492 sf charmer, and I have to tell you it's my favorite. This home has a comfortable, old world feel. Just look at the woodwork. 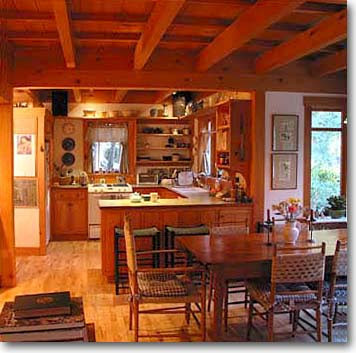 The kitchen is reminiscent of one seen in an English cottage. 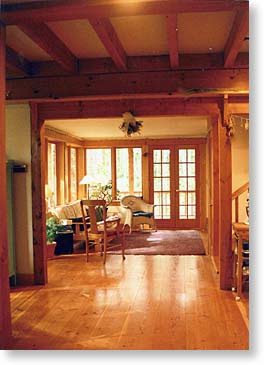 The half door in the dining room reinforces the cottage feel. 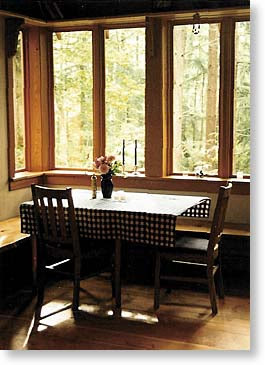 Imagine sitting with family and friends around this table and enjoying the view outside those terrific windows. I hope you've enjoyed the tour of these cottages and small houses as much as I have. Do you have a favorite? A big thank you to Ross Chapin Architects for allowing me to feature these wonderful homes here at A Joyful Cottage. 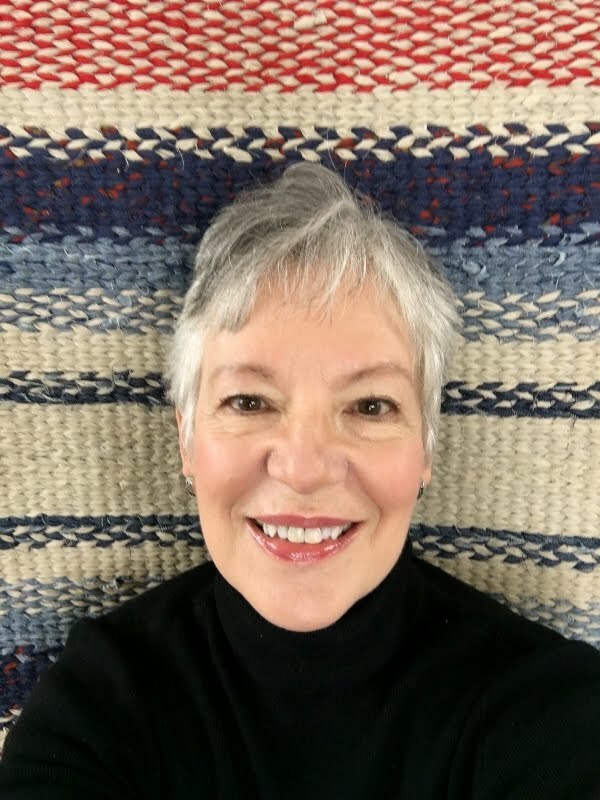 And a special thank you to Debbie at Ross Chapin for getting back to me so quickly and graciously when I contacted her about doing this post. 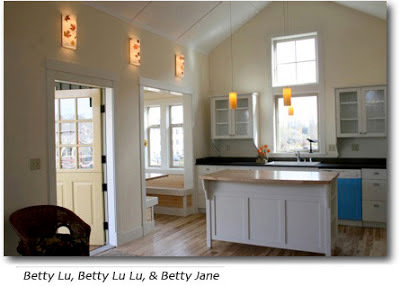 You can learn more about Ross Chapin Architects and view more delightful homes at http://rosschapin.com/. 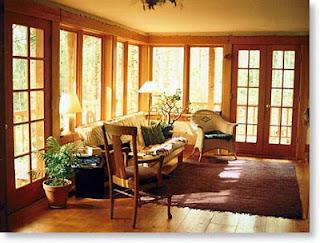 "Just as there comes a warm sunbeam into every cottage window, so comes a love-born of God's care for every need." Thanks for sharing, Nancy. They are so beautiful. My favorite is the Three Gable Cottage--I can just see it nestled in our big oak & pine trees. fabulous, oh what fun it must be to live in this community!! 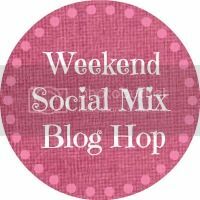 I wonder if there's a pocket neighborhood just for blogging friends, Anne? 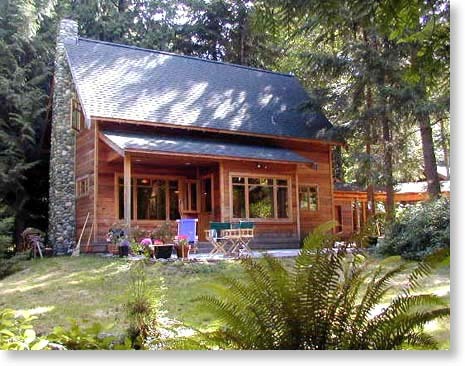 I'd want to be next to your cottage where all that beautiful creative work takes place. Three Gables is calling my name! 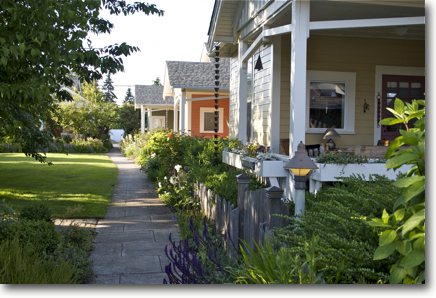 With the right neighbors a pocket neighborhood could be so much fun. I love all the front porches especially. Agreed, Dewena. Good neighbors are so important. I cannot choose a favorite one, they are all amazing!!!!!!!!! You had lots of kind words about our homes, Nancy. Thanks so much. 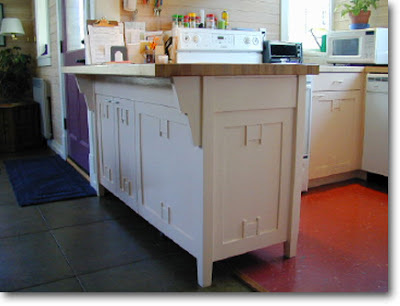 It was so much fun to blog about your homes, Debbie. Thanks for taking the time to comment. 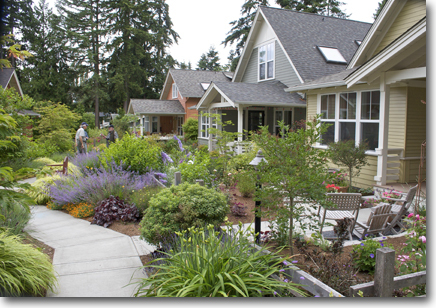 I loved visiting these pocket neighborhood homes Nancy! I couldn't choose a favorite myself. I loved something about each one! They looked like HOMES instead of just HOUSES! Thank you for sharing Nancy! Renee, you hit the nail on the head. 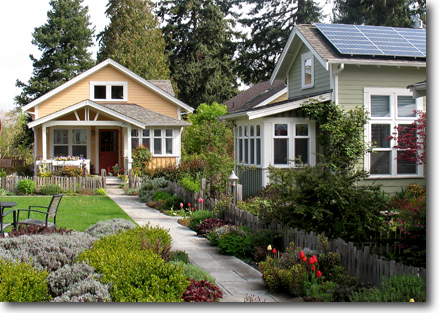 These ARE homes and not just houses. This is one of the reasons I chose to blog about Ross Chapin Architects. 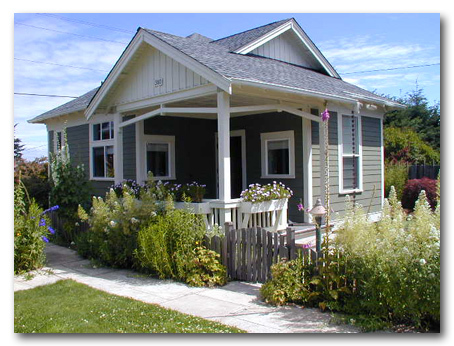 There is a movement toward smaller houses now, but so many of the ones I see are sterile, without character. Especially when it comes to the interior. 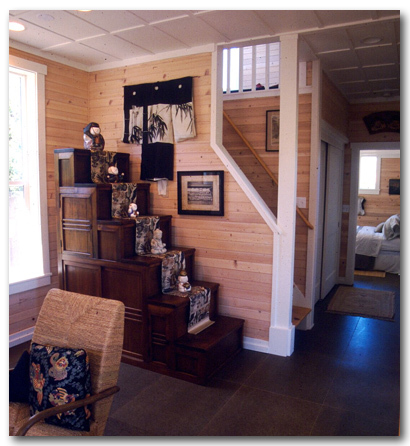 Chapin's designs show us that we can live large in a small home. Thanks for visiting and leaving your thoughtful comment. I love hearing from you. Have a great day! Just delightful Nancy, inside and out. I especially love the white cottage kitchens. 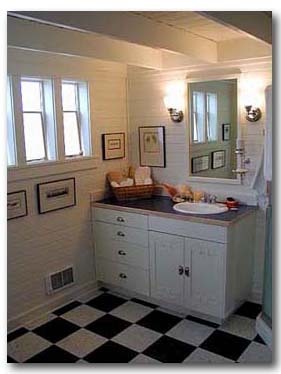 We recently put b&w tile in our basement bath. Now in the painting process. Can't wait till it's all complete. I loved this post. When it comes right down too it, that's all you ever really need...a cozy place to dwell. Thanks for sharing! 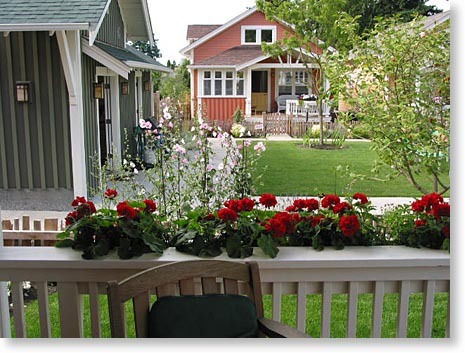 I could live in any of these beautiful, sweet cottages. 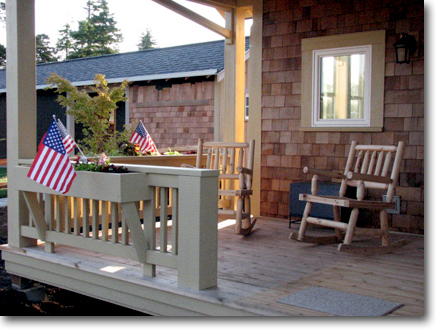 It was my pleasure to share these cottages. Thanks for stopping by and taking the time to comment. Blessings. I am ready to move into the Dines Point cottage - I love old houses with the detail, like you mentioned - and the windows. I also love the community created - reminds me of the little neighborhood in Alvin and the Chipmonk movies - and I remember thinking, "I want to live in a place like that." Oh, each of those cottages are just too perfect. I live in a small cottage and love it. Downsizing makes life easier. I can barely keep my 1,000 square feet clean so I don't know how I ever kept our bigger homes clean.